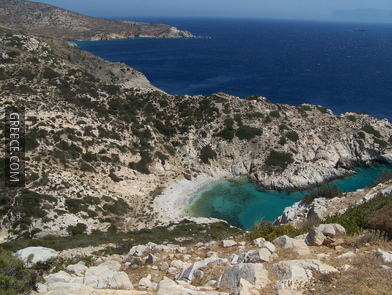 Donoussa is one of six small islands (Little Cyclades) between Naxos and Amorgos in the Aegean. The area is only 14km² and the population is around 130 people. The island offers an alternative to mass tourism, plush resorts, crazy nightlife and cars. However, in the last few years, the number of visitors has increased. There is a very good chance Donoussa will be crowded if you visit during high summer season (July – August). The only and best thing you can do here is lie on the beach and soak up the sun. 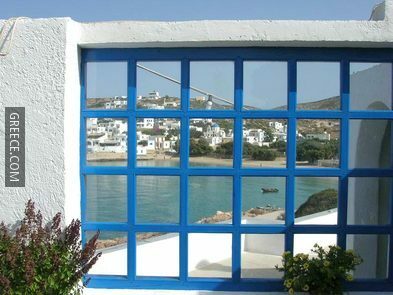 Donoussa, as part of the Little Cyclades, shares the history with its neighbors. Donoussa was inhabited during the prehistoric times and later became vital to the Cycladic Civilization. During the Roman Era, the island was a place of exile, while during the Middle Ages, it served, among others, as a pirate hideout. Agios Stavros: This is the main port of the island and also the capital. It is a beautiful quiet village with a nice sandy beach and few trees. On this beach, it is not allowed to camp or to practice nudism. Most tourist facilities are provided: taverns, cafes, bakeries, mini-markets and rooms to rent. Kalotaritissa: It is a lovely small village with one tavern. Troulos, Messaria and Mersini, are the other villages of the island. All of them are connected together by a main road. 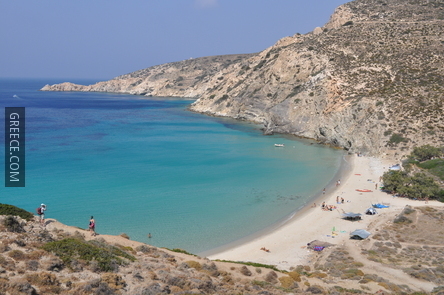 Panagia: it is the closest beach to Stavros and you can reach it by a 15-20 minute walk. It is a nice beach with soft sand and length of approximately 150 meters. Kendros: it is over the hill to the west. 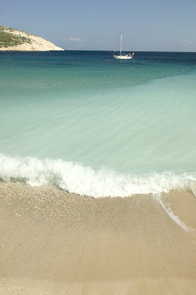 It is a sandy and secluded beach with crystal clear waters. Kendros, in the past, was one of the main places for camping. 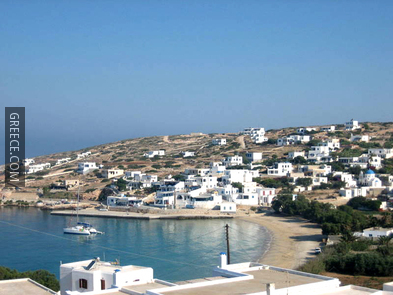 Livadi: it is located to the east side of the island, below the settlement of Mersini. This nice sandy beach is completely isolated, as it’s the most distant from the port (2 hours walk). Limni: it is a small beach with pebbles and sand in the north, about a 20-minute walk from the port. 1. Cave of Tichos: This cave, located near Asrpos Kavos, in the northwest side of the island is worth a visit. 2. Churches: In the capital you will see the church of Agios Stavros (Holy Cross) which gave its name to the village. On the hill you may visit the churches of Panagia and Agios Ioannis. 3. For those who love hiking and discovering the inland, you can follow the recently constructed road, which circles the island. You will pass through all other villages and return to Agios Stavros in a six-hour walk. 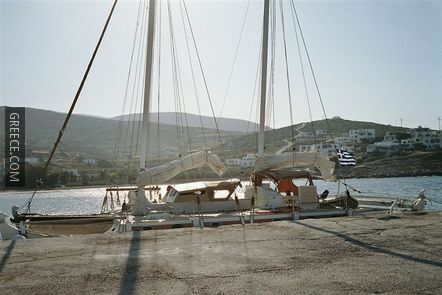 Donoussa, and Little Cyclades generally, do not have frequent links to other islands or the mainland. 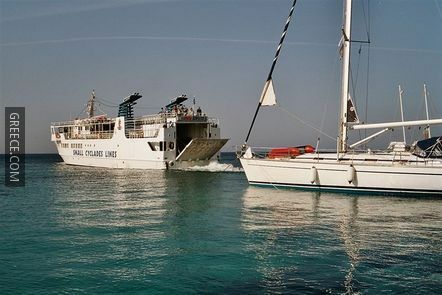 A few times per week, a small boat and local ferries connect the island to the rest of Cyclades. Since no cars are allowed on the island, you have two options to get around: on foot or on a donkey. The climate of Donoussa is similar to the other Cycladic islands and is typically Mediterranean, with mild winters and hot, dry summers. From April to August, the sun is always bright.